The Bengal cat breed was created from the dream of Mrs Jean Mill, who wanted to create a domestic cat with all the physical characteristics of a genuine feline bengalensis, combined with the personality and temperament of a domestic cat. 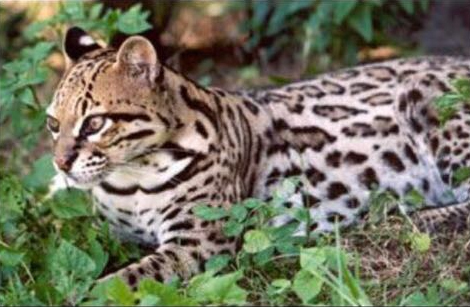 The Bengal breed is a unique breed of cat, with their wild leopard coat, intriguing qualities of a wild cat, their agility and high intelligence, separates the Bengal cat from a typical domestic cat. The Bengal cat has many attributes to a wild cat . Bengal kittens as like wild cats too undergo a period of “fuzzy” as a camouflage against predators in the wild . The “fuzzy” stage or more commonly known as the “fuzzies” can last up to the age of 6 months . After this time their beautiful coats will clear up to show off their amazing spots/rosettes (see our stunningly beautiful rosette Queens). The Bengal colours and coat will continue to develop further for the following 2 years. The Bengal is the only breed of cat to have rosettes, its fur is soft, silky and feels like velvet to touch. A Bengal coat should appear to be covered in a fine layer of gold glitter (see our glitter coated stud Bali Bengal Quartz). 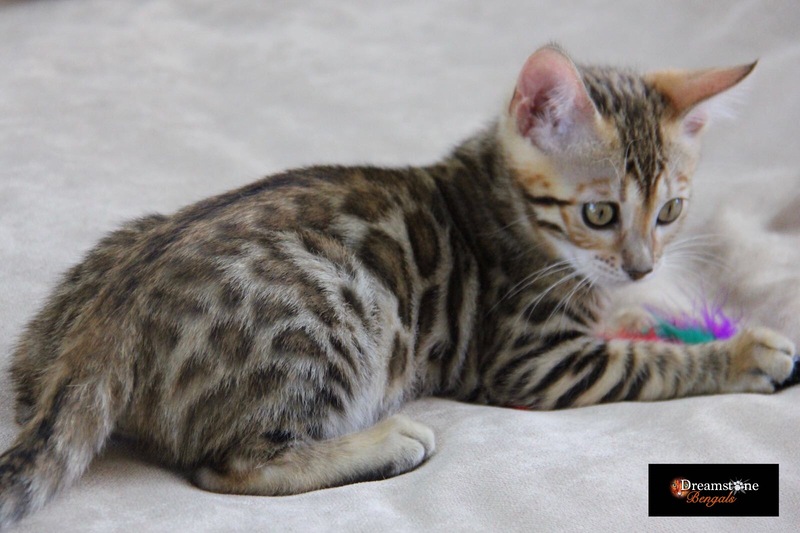 Bengals can also have a marble coat, as well as various colours including seal minx, silver, blue and charcoal, the traditional brown spotted/rosetted is still the most sought-after coat. 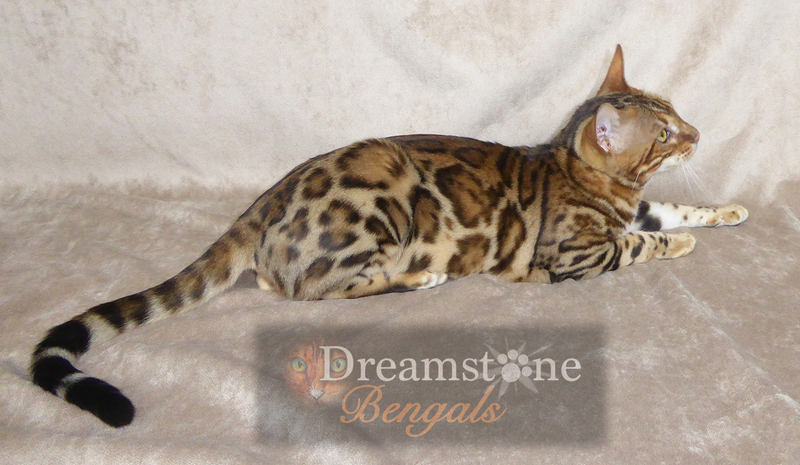 Dreamstone Bengals U.K, specialise in the traditional brown spotted/rosetted Bengal (see our amazing stud Brokenmoor Dax), combining the best bloodlines from America, Canada and Europe.